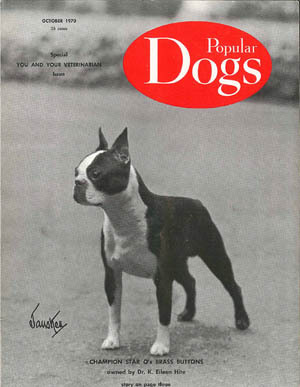 October 1970 issue of Popular Dogs featuring the Boston Terrier Ch. Star Q's Brass Buttons who was the last Boston Terrier to win the Non-Sporting Group at the Westminster Kennel Club Dog show in 1970 and was the first Boston in 22 years to do so. Front cover of the Feburary 1985 issue of the Boston Bulletin (now called the Boston Quarterly). 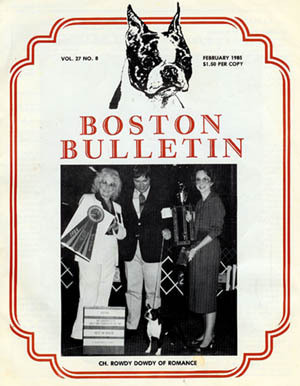 On the right side of the photo is the 1985 President of the Oklahoma City Boston Terrier Club, Mrs. Gayle Freeman Cook, holding the OCBTC Specialty Trophy. 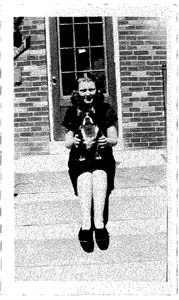 George Ewart, a Member of the Oklahoma City Boston Terrier Club, found this old photo in Jefferson, Texas at an antique store. This is quite a find! 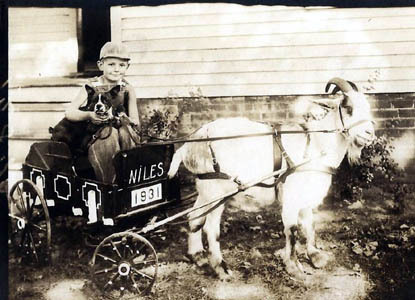 A young boy and his Boston Terrier in a cart, with the date of 1931 written on the cart, and is being pulled by a goat. Thank you for sharing this amazing photo with us, George! 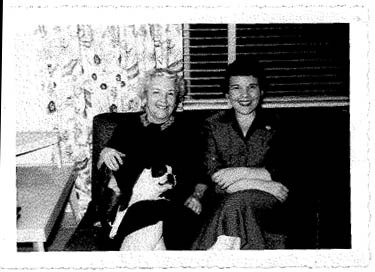 OCBTC Club Members Marge Dillender and Larry Rosson, researched and discovered that a Boston Terrier was the first Mascot for the University of Oklahoma. Mex The Dog: He died in 1928 and is buried in a small casket underneath the Galylord Family Oklahoma Memorial Stadium. The University closed for his funeral on May 2. 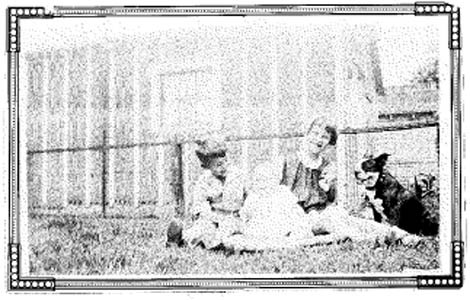 Used Oklahoma football and baseball games from 1915 until his death, Mex the Dog wore a red sweater with a big red letter 'O' on the side. His main jobs was to keep stray dogs from roaming the field during a game in the days when the football field was more accessible to non-ticketholders. Mex was initailly a helpless 'Stray' in Mexico. Then, a U.S. Army field hospital medic, Mott Keys, found him in 1914 during the Mexican Revolution. Mott Keys was stationed along the Mexican border near Laredo, Texas, and found the dog among a litter of abandoned pups one night on the Mexican side. 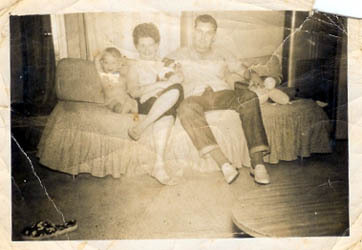 Mex was adopted by Keys' company, and when Keys finished his duty and moved to Hollis, Okla., he took Mex. He later attended OU and Mex followed him again. At OU, Mex's experience as an Army medic company mascot landed him the job with the football team and a home in the Kappa Sigma fraternity house. He quickly became Oklahoma's most famous dog. 'A joyous staccato bark cheered Sooner touchdowns' at football games and a 'victory woof' punctuated home runs at baseball games. But Mex began to gain national attention in October of 1924 when the OU football headed north to play Drake. Mex did not board the train in Arkansas City, Kansas, as the OU football team and its boosters switched cars to head for Des Moines, Iowa, and the game. Missing their beloved mascot, the Sooners were shut out by Drake, 28-0. The headline from the Arkansas Daily Traveler on October 28, 1924 left no doubt as to the cause of the humiliating loss: "Crushing Defeat of Bennie Owen's Team is Charged to Loss of Their Mascot Here". Mex was eventually discovered in Arkansas City pacing the train station platform. OU grads J.D. Hull, Hughes B. Davis and J.C. Henley recovered Mex and the men drove him to the next Sooner game against Oklahoma A&M in Stillwater. 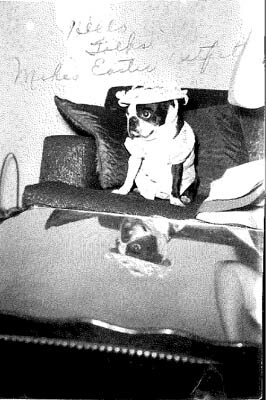 "Mike", early '50's dressed in his Easter best and looking tolerant but less than pleased! Mike is Michelle Carter's Grandmother's dog. 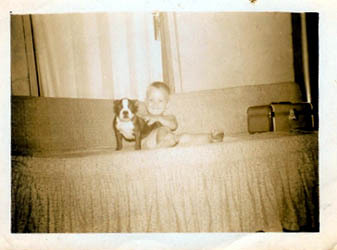 Debra Denney Ewart when just a little baby in the early 1960's, with her Boston Terrier named "Koolaid". To this day, Debra just LOVES the Boston Terrier Breed! 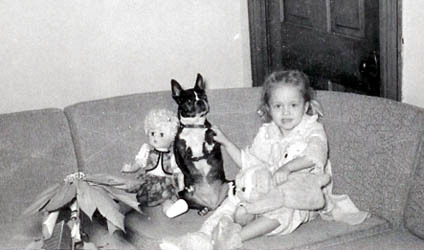 Debra with her parents, Virginia (holding Koolaid their Boston Terrier) and William Denney. Circa early 1960's. Copyright © 2012 ~ 2014 Oklahoma City Boston Terrier Club & JLS Canine Services Web Design. All Rights Reserved. No part of this site may be reproduced without permission unless otherwise stated.